Hydrogen can provide pure and clean energy; however, to use it as an energy source, facilities such as hydrogen carriers and recharging stations need to be constructed. Structural steels are affected by hydrogen embrittlement (HE), and their susceptibility to this needs to be investigated prior to their use in construction. Most structural steels are normally fabricated using thermomechanical controlled processing, which produces a large dislocation density to increase strength. 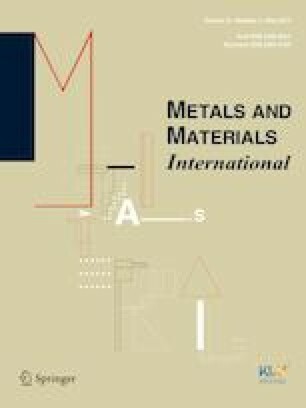 This study investigated the prestrain effect on HE susceptibility of EH 36 steels using thermal desorption spectroscopy (TDS) and in situ slow-strain-rate testing. Hydrogen was electrochemically charged into specimens, and the reversible hydrogen content and that relating to trap sites were measured using TDS. With an increase in prestrain, there was increase in the diffusible hydrogen content; furthermore, with hydrogen charging, there was a drastic reduction in total elongation with an increase in prestrain. In addition, there was an increase in HE susceptibility with an increase in prestrain compared to when an air condition was employed. Specifically, there was an abrupt increase in HE sensitivity at a prestrain value between 10 and 15%; strain hardening was more dominant below a prestrain value of 10%; and HE was more dominant above a prestrain value of 15% for EH 36 steels. This work was supported by the National Research Foundation of Korea (NRF) funded by the Ministry of Education (Grant No. NRF-2016R1D1A1B03933994), and the World Class 300 Project R&D (S2482209) of the MOTIE and MSS (Korea).